Residents of South Carolina as well as Florida know for a fact that there are some golfers who stick to the 50 degree rule. It simply means that if it is not at least 50 degrees Fahrenheit outside then there’s no way they would play in any golf course. But for those who live in Connecticut and have participated in late fall junior golf tournaments as well as early spring high school matches, the 50 degree rule means a different thing. The temperature during the days of competition hardly ever reach 50 degrees. The shoulder as well as the off seasons at golf courses mean significantly reduced green fees. A lot of golf courses will offer big discounts to those who play in November, which encourages lots of hardy golf players to play on a budget. Since the cold weather have a tendency to keep fair weather golf players away, despite of the price, you can expect to have the Myrtle Beach golf course almost all to yourself. It does not matter how perfect the weather is, three hour game of golf in chilly temperatures easily beats a round that lasts for five and a half hour. For the most part, the cold weather does not really mean a drastic change in course conditions, with a single caveat; several golf courses are going to aerify their greens by the end of the season, and so if sand and bumpy putting surfaces are a deal breaker, you have to sure to call ahead of time so you can get the skinny from the golf course that you are looking to play. In case they were not punched, greens may be a bit slower than normal. On tee to green, you should expect fast, firm, and fun conditions, especially on a golf course that just came out of a frost delay. Walk the golf course – golf carts are almost everywhere these days. However, if you do not want to head out on a cold day, sitting in a cart is the perfect way to make sure that you will be miserable from beginning to the end. The physical exertion of walking 9 or 18 holes will help your blood circulation and make you feel warmer. Use a trolley or carry your bag. The important thing is for you to work your legs so you can enjoy the cold weather round of golf. Bundle up completely – this is quite obvious, although this used to imply wearing on thick clothing which made it hard to swing properly, modern layers are now thinner, warmer, and designed to move with you. You can go for a long sleeved base layer, a regular golf shirt, and a quarter zip pull over from Under Armour. In case it is windy, you can substitute your pullover with something that is wind or rain resistant. You can also wear flannel lined or corduroy pants can help you keep warm from the waist down. However, these are only optional because as mentioned earlier walking can warm your legs. The hat is the most important item in your golf attire. Go for something woolen or one that comes with a performance layer than the typical baseball cap. Just be sure that the hat covers the tops of your ears at the very least and surely you will be comfortable. Now for your hands. One option is the activated charcoal hand-warmers. Even if they are just sitting in your pants pockets they can still warm your upper legs. If you don’t have them, another option is to wear a pair of rain gloves. 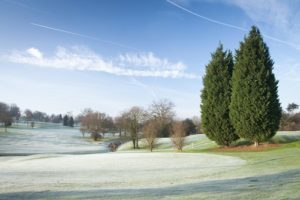 Adjust your playing method – the cold weather will make your shots play longer like the length of the club through the air. You will regain some of this through an extra roll off the tee as well as a bigger first bounce compared to the normal ones on approaches, however, taking another club will serve you well more often than not. Because these rounds are played out of season especially when it concerns your handicap, do not be scared to stretch the rules. Preferred lies in the fairway is obvious and the Leaf Rule is also a good one to take up. Lastly, if you have convinced your group to play, get rid of the scorecards and play match play, a scramble, best ball or alternate shot. You will feel warmer especially when you are having fun. Bring Beverages – a lot of golfers are bringing insulated bottles these days, meaning your tea, coffee, or hot chocolate will be kept hot for a much longer period. And if you like, a nip of whiskey or other spirit will warm your bones in a pitch. In case you would like to imbibe old school, look for some kummel. Call Myrtle Beach Golf Directors for more information about the many different golf courses and golf packages you can choose from.